Throughout the history of bow and arrow, there have been many different types of bows. As societies grew, archery became a cornerstone for advancement. Wars were won with bows and arrows. Archery soon became a sport, and great nations like ancient Egypt and the Zhou Dynasty in China were the first to have archery tournaments. Archery was a necessity for warfare for thousands of years. Up until the invention of firearms, bows and arrows were used by every army in the world. When the firearm was introduced archery lost it charm and became useless in battle. Bows and arrows changed completely when firearms were introduced. They adopted a sense of nobility and a stronger focus on sport. The first instance of archery in the Olympics was 1900, and despite a 52-year absence, it has become a staple of the tournament. Evolution of bow and arrow gave birth to different archery bow types, and they all have their costs and benefits. The advantages and disadvantages of longbows, recurve bows, compound bows and crossbows will be discussed in detail. By understanding these different types of bows, you can better understand the long history of archery. Longbow was the first invented in the 12th century, and soon changed medieval warfare completely. England was able to rise as a superpower thanks to the power of this new type of bow. When the Hundred Years War was going on in the 1400’s, longbow soldiers often outnumbered the swordsmen 5:1. The English adopted the longbow so quickly because of its incredible strength. At a range of 200 yards or less, the longbow could pierce any kind of armor. When the longbow became a major weapon, Englishmen would train since they were children to join the elite group of longbow archers in the English army. The first recorded appearance of the recurve bow was around the third century in ancient China. Before the recurve, bows were only straight-limbed, with both ends curving toward the archer. The limbs of the recurve face away from the archer, which adds energy to the shot. The unconventional design was innovative, but improper training led to many instances of confusion. When recurve bows were introduced, commanders had to retrain all of their soldiers to use the new bow. Untrained soldiers would often restring the bow backward because of the opposite design, which led to the bow being destroyed. Despite the problems when this bow was introduced, the recurve bow has become the most popular option across the world. The Olympics, as well as many major archery tournaments, will only allow recurve bows. 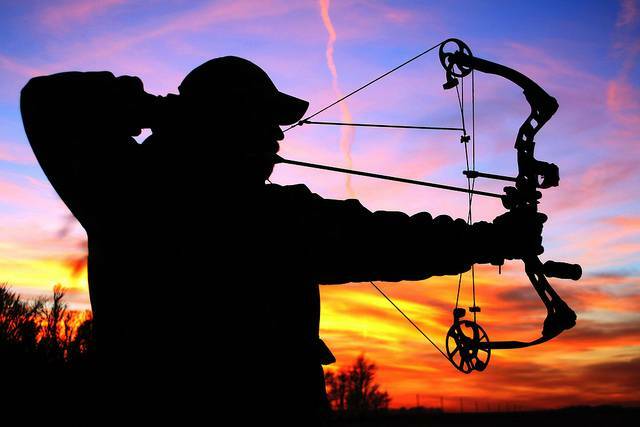 The compound bow’s most popular feature is the “let-off” effect. The let-off effect revolutionized how a bow can be drawn back by the archer. A traditional bow would get more tense as the bow was pulled back, and the archer would feel more and more strain. This led to fatigue and lowered accuracy. With the inclusion of pulleys, this problem was solved. When an archer pulls back, the pulleys activate, and the tension goes away once the bow is pulled to a certain point. With minimal tension, archers can pull back as far as they want without overwhelming tension getting in the way. The compound bow may look intimidating and confusing with all of its pulleys, viewfinder, and web-like design, but it makes shooting the bow easier. Since it’s creation, it has become a favorite bow for serious archers. Though the crossbow is a mechanical weapon similar to the firearms that were introduced in the 19th century, the crossbow was first invented in the third century. Rough designs of crossbows are recorded from ancient China, as well as ancient Greece. Alexander the Great is one of the first notable warriors to use crossbows in battle. During the 15th and 16th centuries, crossbows became a central part of European warfare. Crossbowmen were considered elite soldiers in the military. The commanding officer of the crossbow corp. Was one of the highest military positions in countries like Spain, France, and Italy. The power, distance and accuracy of crossbows made them the most powerful weapon in all of the medieval warfare.If not for the bulkiness and heaviness of the weapon, it would have replaced all bow and arrows completely. Longbows became a symbol of elite culture in medieval England, durable and with a long extension. Recurve bows flipped the design of bows around and in doing so they made the shot stronger and faster. Compound bows were only a recent invention, utilizing pulleys and viewfinders to make bows more precise than they have ever been. Crossbows are more mechanical than any other bow, with power more similar to a firearm than a bow. All archery bow types have strengths and weaknesses and their own unique place in history.